Editor’s Note – Beekeeping in Chicago is allowing former prisoners build unique job skills and make a living. Brenda Palms Barber and her organization Sweet Beginnings are transforming lives and taking care of our native pollinators at the same time. This article was originally posted on FUTUREPERFECT and written by John Mulrow. 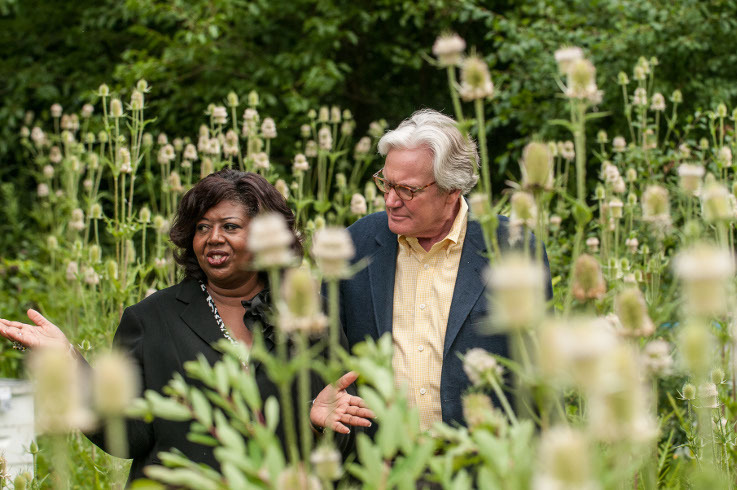 In Chicago, Sweet Beginnings helps people returning from prison learn how to make a living with bees – changing ideas about ecology and imprisonment along the way. The ground crew at Chicago’s O’Hare Airport are used to dealing with nature, de-icing planes in the wintertime and rolling over steaming hot runways in the summer. They are ready for anything nature might send their way. That is, until a swarm of honeybees decided to perch near a flight gate one sunny afternoon. The crew mulled over a few ideas for dealing with the buzzing mass of bees, including spraying them with a hose or dousing them with pesticides. However, before any of the ideas could be put to action, the Sweet Beginnings team arrived and scooped up the swarm and its queen bee, whisking it away to be installed in a new hive. The team maintains 75 hives in a remote field on O’Hare property—the largest airport-based apiary in the United States. Though it was later found that the swarm did not originate from any of the Sweet Beginnings hives, the team did not mind the trip. “We were doing outreach right there on the spot,” recalls Brenda Palms Barber, founder and CEO of Sweet Beginnings. “While we were collecting the swarm, we were also chatting to the ground crew about honeybees, their behaviors and the ecological importance of pollinators.” While Sweet Beginnings has done much to promote bees as a resource rather than a pest, this is not their primary mission. It is, however, a fitting product of their work—just as honey is a fitting product of the invaluable work of pollination. 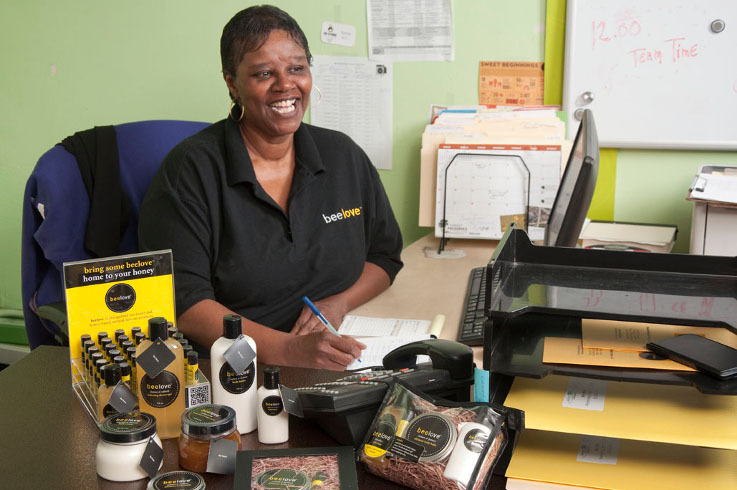 In 2004, NLEN launched Sweet Beginnings, LLC as a job training and revenue-generating project. 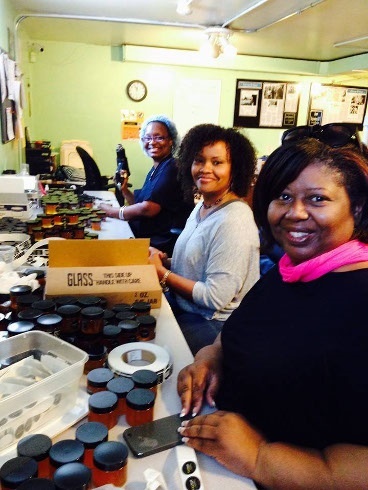 Aided by a local beekeeper and several environmental and social organizations, NLEN’s clientele began learning how to care for honeybees, to extract and package honey, and to infuse the honey into soaps and lotions. By 2014 the enterprise had 131 hives throughout Chicago and had trained 383 individuals in beekeeping, honey production, packaging, distribution logistics, and marketing. Their beeloveTM line of honey and honey-based products can be found in several major grocery store chains in the region and at shops throughout Chicago’s main airports. In 2014, Sweet Beginnings added 50 new hives, harvested over 1,600 pounds of honey, and employed 19 individuals—all of whom avoided reincarceration. NLEN tracks this last measure, the recidivism rate, meticulously and has shown that former Sweet Beginnings employees have a recidivism rate below 10 percent. Compare this to the U.S. recidivism rate of 40 percent and the 55 percent rate in the state of Illinois. It is difficult to find work in the United States if you have been incarcerated or have a criminal background. The events of 11 September 2001 in particular made employers reluctant to hire anyone with a history of incarceration. After 9/11, “NLEN [could not] generate enough job placements for the increased demand for jobs.” This creates a vicious cycle in which any level of imprisonment becomes a major barrier to steady employment. The formerly incarcerated often fall back on selling drugs or other illegal means of making money. Furthermore, the law enforcement and criminal justice systems tend to disproportionally target non-white ethnicities and low-income communities. Palms Barber also points out that environmental work and urban agriculture are often seen as luxury activities. “I don’t have time for that. I need a job,” she often hears. But Sweet Beginnings bypasses this attitude by starting with economic opportunity and job skills, and letting ecological awareness sink in through the process. It doesn’t take long for Sweet Beginnings employees to take note of their bees’ dependence on green areas and habitat undisturbed by pesticides. Trainees learn about honeybee biology, the importance of pollinators, and the negative health effects of refined sugar and unnatural skin care products. These concepts translate naturally to the Sweet Beginnings business model and play a role in marketing beeloveTM products. The enterprise is even spinning off new environmental heroes. Two former employees recently launched a beekeeping and honey supply shop under the name West Side Bee Boys. Thad Smith, the founder, entered Sweet Beginnings seeking to overcome his own criminal record and job-seeking difficulties. He quickly became fascinated with bees and rose to Assistant Beekeeper within the organization. He is now charting his own path with West Side Bee Boys and wants to start promoting carpenter beekeeping across the city. “Carpenter bees don’t produce honey, but they forage locally and do wonders for your garden,” he explains to his farmers’ market customers. West Side Bee Boys sells its own honey as well as carpenter beehives, which are cheap and easy to install in a backyard. Brenda Palms Barber sums up the success of Sweet Beginnings and its alumni with a fitting metaphor: “You know, bees don’t distinguish between ‘weeds’ and ‘flowers.’ They’re after the nectar inside.” NLEN and Sweet Beginnings follow the very same principle with the population they serve, focusing on people’s potential to blossom in the workplace. As Chicago’s honeybee population expands, so too does an ecological and health-conscious workforce, offering not just sweet beginnings but a bright future as well. About the author – John Mulrow is the Interim Executive Director of Plant Chicago, a non-profit organization working to develop closed-loop systems of food production, energy conservation and material reuse. Plant Chicago seeks to empower people of all backgrounds to make their cities healthier and more efficient. Thanks for your comment. If you mean starting a Sweet Beginnings chapter, you would have to contact them. Here is the website: http://www.sweetbeginningsllc.com/ Good luck!